It is now time to fill in the final box of our recent travel across the Entrepreneurial Strategy canvas. Recall that I argued that there were two key dimensions that could assist entrepreneurs in finding the right business model to match with their idea: (i) they could focus on execution or invest in control and (ii) they could be oriented towards competition or cooperation with established firms. The power of these dimensions is that choices along them are substitutes: it is often better to choose one or the other than both. For entrepreneurial firms with limited resources and who need to learn about the right strategy for their idea, it pays to focus on one end or the other of each dimension. 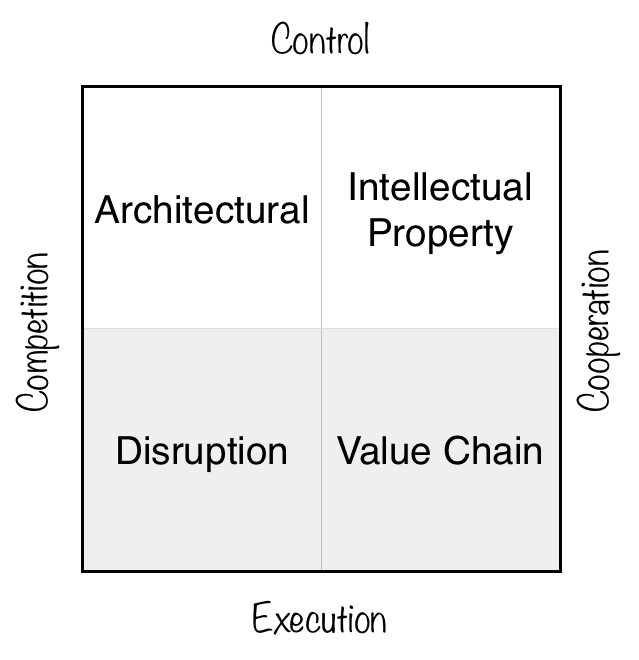 In broad terms, this gives us four strategies to choose from and in previous posts I talked about the Disruption Strategy (Execution + Competition), the Value Chain Strategy (Execution + Cooperation) and the Intellectual Property Strategy (Control + Cooperation). Today, I would like to fill in the final box and talk about Architectural Strategy. An architectural strategy involves investing in control and being oriented towards competition. And it is a tricky strategy to implement, let alone master. In fact, my guess is that it is often the case that it is actually undertaken by experienced, serial entrepreneurs rather than first timers. For example, a few weeks back I discussed Tanium. It was running what appears to be an architectural strategy with lots of control over their security product and a plan that would allow them to amortize it well into the future without huge amounts of on-going effort in capabilities. (That said, once they are an established firm they might choose to do that as well; that’s the difference between entrepreneurial strategy and strategic management. The latter allows you to pursue more options even if they are substitutes). Tanium was founded by previously successful entrepreneurs. While the word ‘disruption’ has been heavily used by entrepreneurs and other innovators, there is a related concept of architectural innovation that has been of significant interest to academics studying why great firms fail. Pioneered by Rebecca Henderson and Kim Clark, they noted that sometimes established firms fail to respond to entrant innovators even though the components entrants are using are familiar to established firms. For instance, the initial iPhone used readily available components but a different architecture in terms of how those components were combined. No established mobile phone maker was ever able to replicate that architecture. Henderson and Clark believed that architectural innovations were difficult for established firms to replicate precisely because they were so good at producing for their own, previous, architecture and they could not have it all. A related notion can apply to entrepreneurial strategy. When an entrepreneur chooses to create a new value chain outside of the established ones and does so by building out from their own idea, they are engaging in an architectural move. The idea is that while it may be obvious to consumers where value is coming from, in pursuing an architectural strategy, an entrepreneur is engaging in actions that invest in sufficient control that imitation is difficult or impossible. So just as established firms may have difficulty in responding to architectural innovation, when an entrepreneur successfully pursues an architectural strategy, no firm (established or otherwise) is able to respond in sufficient time to prevent the entrepreneur from having their control over the new value chain undermined. The end game is a new venture where, in the future, consumers may continue to purchase the entrepreneur’s product even when better alternatives are possible or available. An instructive case is the strategy undertaken by eHarmony. Founded by Dr Neil Clark Warren and Greg Forgatch in 1998, eHarmony launched two years later after receiving substantial investment funds. eHarmony was an online couples matching platform but it was not the first. Match.com had been available for five years and had a substantial market presence. Warren was a practicing psychologist with a focus on relationship management. He had written numerous popular books extolling the virtues of marriage and saw that the Internet was lacking a service designed to match singles who wanted a serious relationship. eHarmony’s vision would be to provide a way of matching individuals based on long-term compatibility. Upon launch, eHarmony concentrated its marketing on evangelical Christians seeing that group as under-served by other matching services. Within 2 years, it had enough users to be profitable. Interestingly, eHarmony did this by eschewing the textbook strategic tactics to build a platform that would require liquidity to be successful. After all, a critical ingredient in finding matches is having enough singles on the platform and the usual means of doing that is to price low to the stickier segments of the market and to otherwise make it easy for people to sign up. This was match.com’s approach. By contrast, eHarmony set its monthly price almost 3 times that of its competitors and asked them to answer 436 questions with only an 80 percent chance of being approved to be a customer. This questionnaire would take 1.5 to 2 hours to complete (it was later reduced by half). The rationale was that if someone wanted to pay the higher fees and spend the time on the Relationship Questionnaire then they were likely to be serious about the long-term. This selection as well as the extensive information given to eHarmony allowed them to improve their matching algorithm but also led to an older, more educated and majority women composition of customers. The matching algorithm itself took years of development even prior to launch and eHarmony secured a patent for their technology in 2004. The development examined the happiness of existing couples and backed out predictors that could be applied to singles. eHarmony also guided the interactions between potential matches (that were also quite limited relative to other sites) so as to maximize the impact of first impressions. While it is hard to tell if the algorithm itself was a scientific advance, ultimately, eHarmony would only be able to justify its higher subscription fees if it could prove itself successful. An independent study concluded in 2007 that 2 percent of all marriages in the US were as a result of eHarmony. The initial development of eHarmony highlights the two strategic hypotheses underlying an architectural strategy. First, from the perspective of value creation, the founding team must have a well-grounded hypothesis as to why their idea will be of clear value to consumers. For eHarmony, this rested on the notion that the quality of their customer pool mattered as much as quantity. However, to work out precisely what ‘quality’ meant in terms of matches, the start-up had to conduct substantial research. After all, if the questionnaire felt contrived to customers and ultimately led to matches that were clearly inappropriate, the service would not be able to build a reputation that clearly signalled its value. Moreover, eHarmony would not have many shots at this because they were asking customers to make specific investments in them. Fail too often and the customers would stop investing. (see this paper by Hanna Halaburda and Mikolaj Jan Piskorski for a clear articulation of this theory). However, the value creation hypothesis, while necessary, is not sufficient. An architectural entrepreneur needs to articulate a theory of value capture: specifically, what is to prevent others from imitating the core idea of the venture and providing immediate or long-term competition? In many cases an idea will have clear value but will not be secure from competitive forces. This is a very traditional strategic challenge that firms can face but, for the case of an architectural strategy, it is precisely because of the need to demonstrate clear value to consumers that puts it at risk as that clarity is an invitation for imitative competition. To guard against it during the critical initial stages, an architectural entrepreneur must have a pre-planned understanding of what instruments they will deploy to ensure control of their idea during a period of rapid growth. For eHarmony, this theory was a combination of network effects (that is, as consumers came onto the platform, others would find it more valuable to follow) alongside the inability of would be competitors to use price competition to compete. The latter mechanism comes because eHarmony’s higher price was precisely the thing that allowed it to attract customers interested in investing in a serious relationship. If a competitor were to offer a lower price, consumers may understand that this would lower the ‘quality’ of the pool that competitor had to work with. Thus, a lower price would itself be a competitive disadvantage. Indeed, since its inception eHarmony has not lowered its high initial monthly price despite numerous attempts at imitative entry — including by Chemistry a separate service from match.com. That completes my discussion of the entrepreneurial strategy canvas. Our hope is that it will assist entrepreneurs in both sorting out and choosing amongst the options available to them. There are many and it pays to be strategic about the one you pursue first. Next PostNext Should Wikipedia have robot helpers?